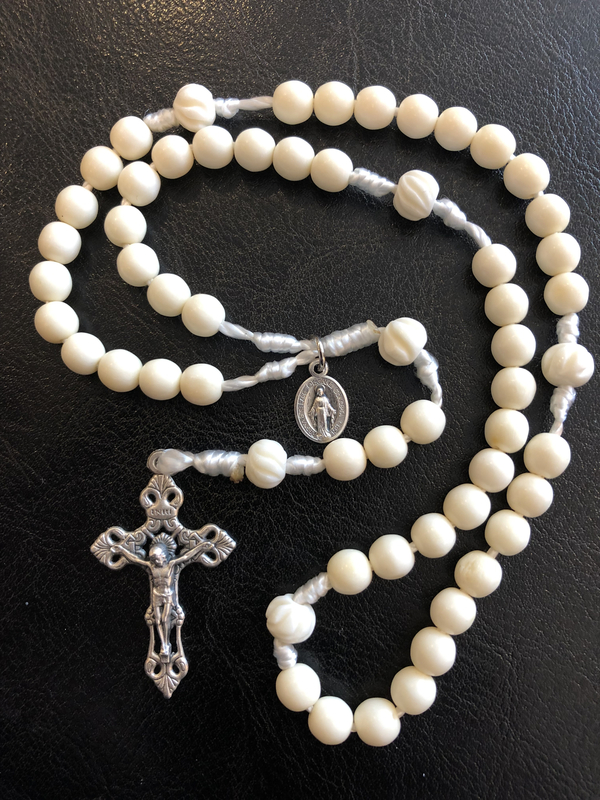 Bone Bead Cord Rosary, 7mm & 8mm bone beads, 18 gauge nylon cord, metal crucifix and miraculous medal. This is my ‘daily driver’ when it comes to rosaries. Simple, high quality beads, comfortable to use, wears well in pocket or purse, incredibly durable and practically indestructible. It also has a nice aesthetic. It is very comfortable to use and to carry in your pocket. This is a hand made bone rosary utilizing all new parts. 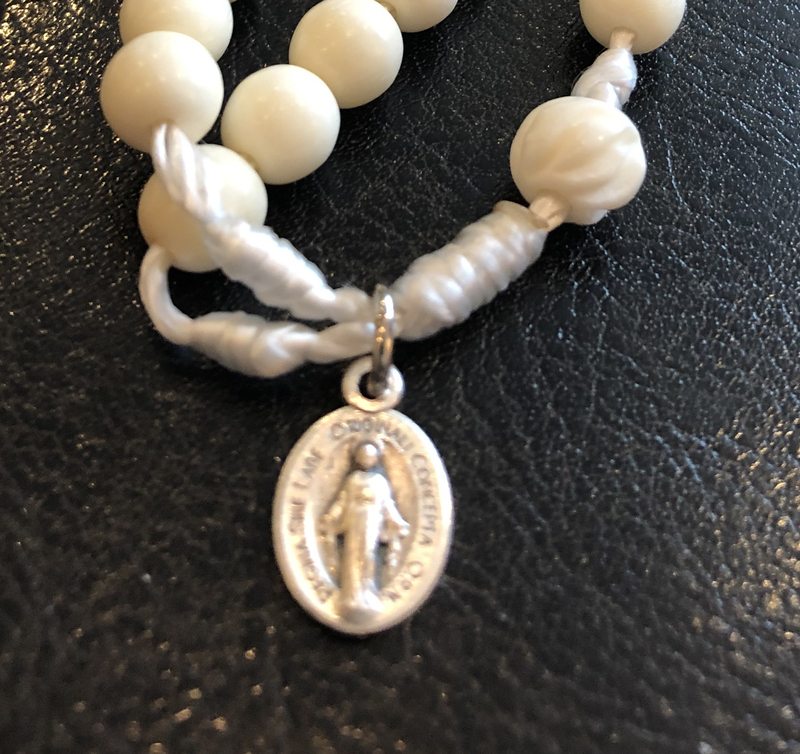 The Ave’s beads are 7mm plain rounds and the Pater Noster beads are 8mm carved rounds. The Ave beads are purposely spaced apart loosely between knots for easy handling and keeping place while praying and meditating. The Ave beads are purposely spaced apart loosely between knots for easy handling and keeping place while praying and meditating. 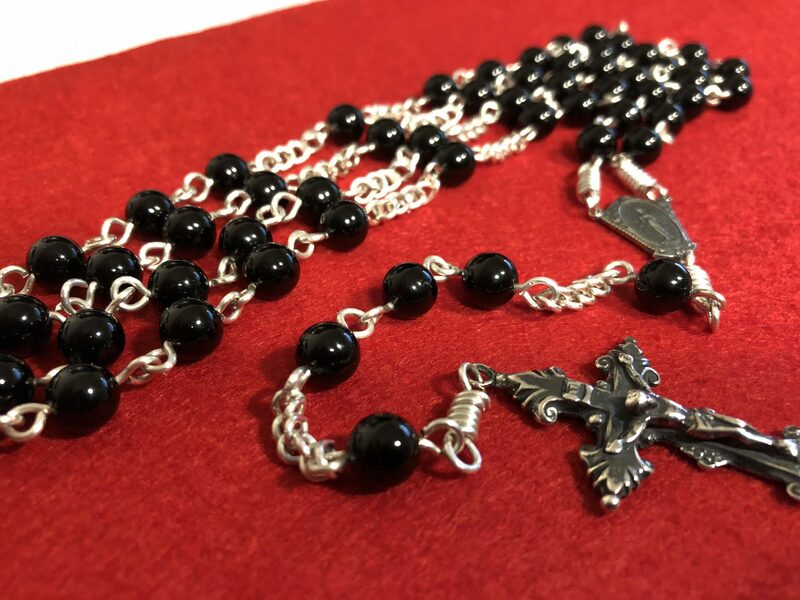 This rosary is strung with 18 gauge nylon tri-stranded cord. The parts are made of oxidized metal (crucifix and Miraculous Medal). 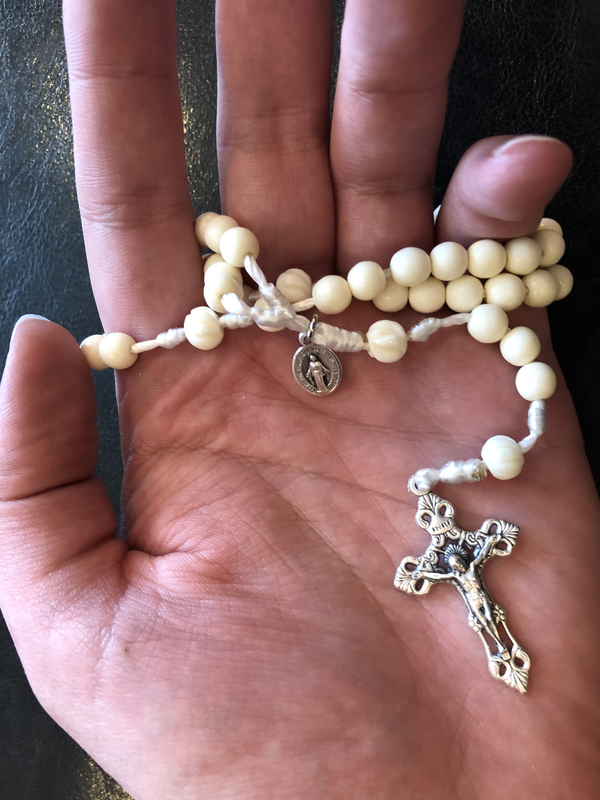 This rosary will most likely never break and is a great daily rosary. It is very comfortable to use and to carry in your pocket. 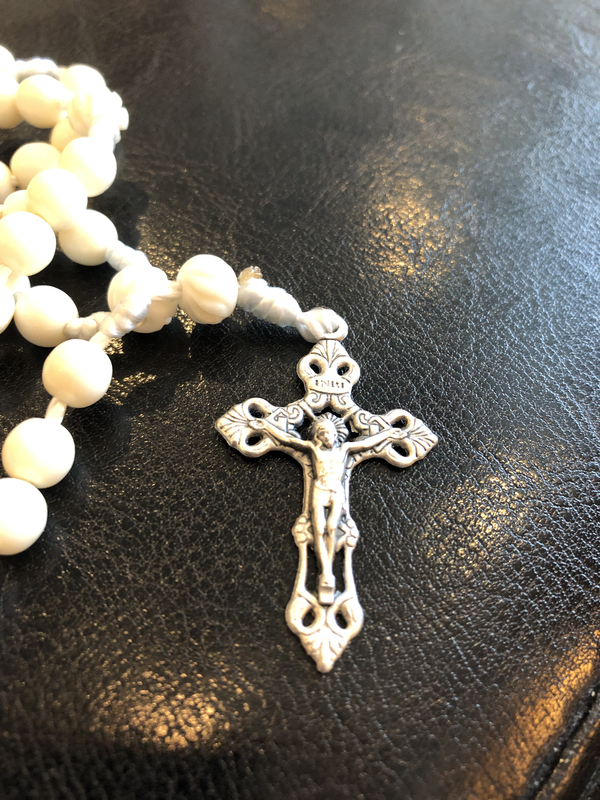 If you have never had a bone cord rosary, the beads become very smooth and shiny after months of use and become more beautiful with age and use. 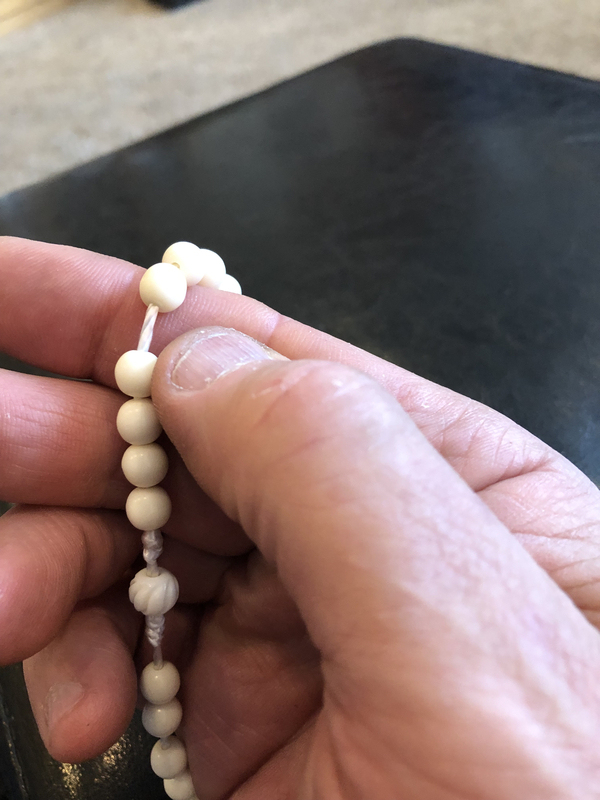 The strength of this rosary is demonstrated in the video of suspending a 16lb. wooden chair from the rosary loop.